So, each year we only watch ONE football game of the year, that's the Superbowl baby. Doug and I take turns each year picking which team we are going to root for, the other person is then stuck rooting for the opposing team. Then the kids choose which team their going to be on, mama's or daddy's. Doug chose the Steelers and I was stuck with the Cardinals. I'm a big fan of underdogs, and considering it was the Cards first time at the Superbowl, I genuinely wanted them to take the win!!! Samantha & Cameron were on my team, Katelyn chose daddy's. We spent time at my moms house Sunday morning, then we went to Sam's to pick up some food for the day. We put out goodies and start grazing from 4pm until bedtime. 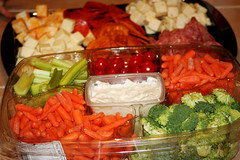 We had a veggie tray, jalepeno poppers, a cheese/sausage tray, pizza, chips, salsa... I regret not having a fruit tray, I think I would have snacked on that alone. As it is, I probably 3gazillion calories Sunday.